Each participant receives T-Shirt, Bottle(s) of water, Light Snacks & Certificate for Participants (please allow 10 business days for processing). If you need the certificate sooner, you can request a PDF version. Click here for sample certificates that will display times for runners and walkers. Volunteers will also receive certificates. Click here to download the Mount Trashmore Park Map. 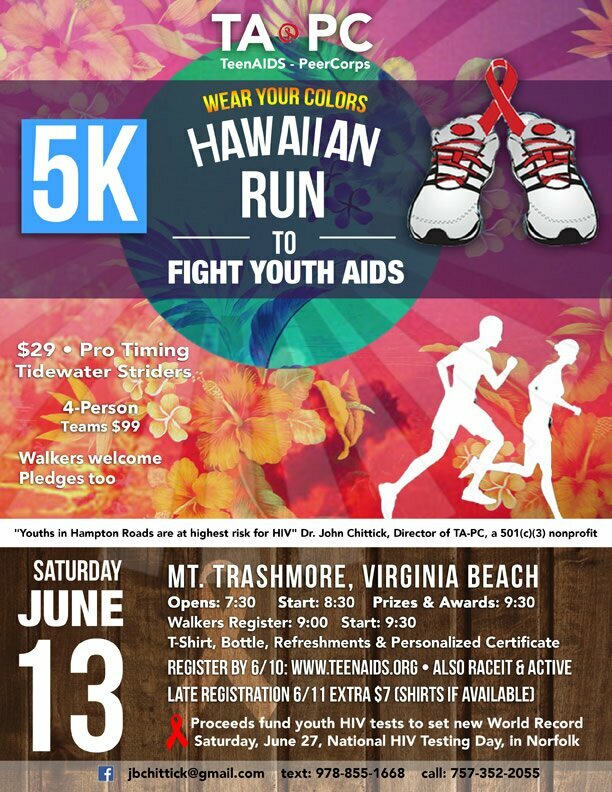 Proceeds provide free youth HIV tests to set new World Record, Saturday, June 27th, National HIV Testing Day, in Norfolk. Our area has the highest HIV/AIDS and STI (STD) rates in Virginia (VDH) and youths are at great risk as they become sexually active (CD). If you'll be running even part of the race, please choose the Running Ticket. Please choose this option if you will only be walking during the event.